It has been a while since I have connected with my photography community. I am disenchanted with the business model of social-media, which is now mostly a monopoly, and like the taming of the neutron, is a double edged sword. So instead, I must double-down on my commitment to my newsletters and blog posts. Today, I have some announcements (ok, promotions) to tell you about. I will be speaking at the LACP on Wednesday February 6th at 7pm, as part of STREET WEEK, joining the two other speakers that evening Ibarionex Perello (host of The Candid Frame) and Thomas Michael Alleman. I thrilled to be a part of STREET WEEK at the Los Angeles Center of Photography (LACP). The week is jam packed with opportunities to learn about street photography including 1/2-day workshops, nightly lectures, the LACP Street Shooting Around the World opening reception, and a guest lecture and workshop by Nick Turpin. I also plan to attend Friday Feb 8 @ 7pm: Street Shooting Around the World – Opening Reception and Saturday Feb 9 @ 7pm: Guest lecture by Nick Turpin. If you want to learn more about what drives my photography, you can purchase my book Life Happens in Color – A Street Photography Manifesto on my Blurb bookstore. I’m traveling to Morocco later in February, stopping for a day in Paris and another in Barcelona. I’ll again be traveling with Within The Frame Adventures lead by Jeffrey Chapman and Winslow Lockhart. I will be soaking up the culture and looking for story. Finally, like my Dad always told me: “Take pictures with people in them”. There is almost no image in my portfolio that doesn’t use layering and a careful consideration of the relationships between image elements in order to tell a deeper story. I’ve written about this approach in my book Life Happens in Color: A Street Photography Manifesto, and recently I wrote a blog post which describes the Compose and Wait method I use to achieve these results. The challenge in making complex layered images, is ensuring that all the pieces of information are working together, organizing the chaos of elements vying for the viewers attention. At the October 1st meeting of the Thousand Oaks Photo Group, I will be speaking on Using Layers to Organize Chaos as an introduction to their November Digital Composition Challenge. If you want to explore this topic in landscape photography, I urge you to study the images of Clyde Butcher, who has used his large-format B&W photography to bring awareness to the restoration and preservation needs of the Florida Everglades. This recognition, in real life, of a rhythm of surfaces, lines, and values is for me the essence of photography; composition should be a constant of preoccupation, being a simultaneous coalition – an organic coordination of visual elements. 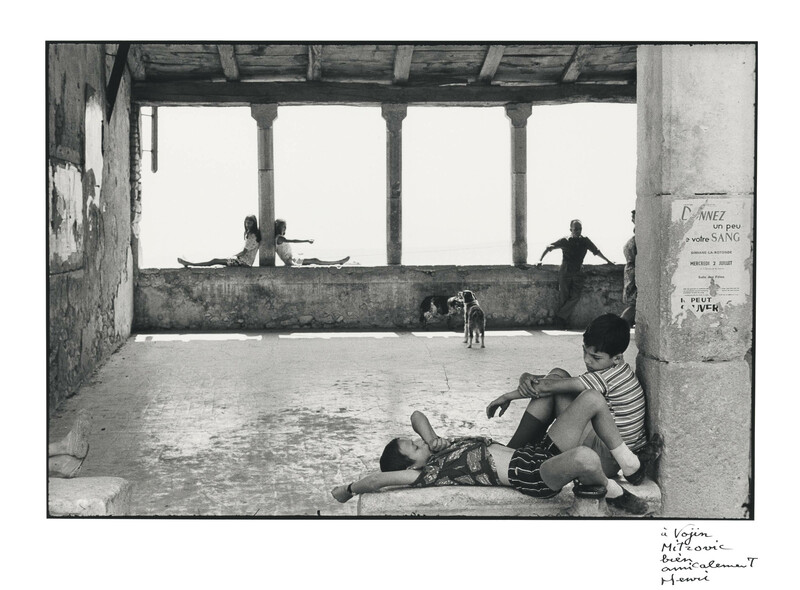 This quote and image by Henri Cartier-Bresson illustrates the importance of looking at the relationships of lines and servers in our photographic pursuit. When thinking about telling deeper stories, I begin by examining how stories are told in literature. Writers use their words to build layers of description and expression for their readers. Some writers can compose single sentences that describe detailed scenes and complex activities. He went from house to house dragging two metal ingots and everybody was amazed to see pots, pans, tongs, and braziers tumble down from their places and beams creak from the desperation of nails and screws trying to emerge, and even objects that had been lost for a long time appeared from where they had been searched for most and went dragging along in turbulent confusion behind Melquíades’ magical irons. The beauty of this sentence from the novel One Hundred Years of Solitude by Gabriel Garcia Marquez, is how its describes far more than a simple static scene. Not only does it details an action taking place over time, but also reaches into the past when it suggests that “even objects that had been lost for a long time” were attracted to these “magical irons”. I have pushed myself to take images that are as elegant and descriptive as this type of writing seeking to build images that refer to actions, describe the present, refer to the past, and lure the viewer to thinking about the future. In order to do this, images need detail, and the detail needs to be organized. I opened this post with a image taken at the Quattro Canti in Palermo. This corner is of an architectural importance, on the corner of each of the 4 districts of historic Palermo stands a nearly identical building but with each representing a different king, patron and season. Acting like a sundial, the face of each building is lit at different times of day. In this image, I use a fairly long lens (90mm effective focal length) to flatten the layers of people passing nearby in shadow against the grand face of the sun-lit building diagonally across the intersection from where I am positioned. Although the perspective has been flattened by the long-lens,the layers are provided by the scale difference between the silhouette of the bike-rider and the two men sitting below the statue. I probably took over one hundred images at this corner while waiting to get just the the right light, the right scene to play out in the distance, and the right passerby and timing. Fairfax Avenue was a thriving Jewish neighborhood of Eastern Europeans and Persians when Manouchehr Monsef purchased Sydney Shoes some 40 years ago. He now spends most days alone surrounded only by his fading shoe boxes with no customer in sight. When I walked into his store, Manouchehr was more than happy to tell me his stories about the neighborhood, and about his sons and grand-daughters. He also told me that he has many names – Manouchehr his Persian name; Moe, the name he used the first time he came to America; but now on his business card he is simply Mike. But the name he treasures the most is “Baba-boo”, his grand- daughter’s pronunciation of “baba bozorg”, the Farsi endearment for Grandfather. The images I took of Manouchehr, “Mike”, represent a variety of compositional approaches – a establishing shot, a portrait, some details, the story of his grand-daughter, and some layered shots. The image above is the most layered and taken from a unique perspective that provides not only the needed details about the person and the scene, but also an off-balance perspective that is consistent with the story. The establishing shot is a straight-forward composition that ensures that all the elements are cleanly delineated and carefully included within the frame – the shoes, Manouchehr with his zig-zag posture, and the shelves filled with faded shoe boxes. The portrait gives us a sample of his personality, describing how things have changed. The environmental portrait puts Manouchehr in his environment with the cluttered desk. They story he shared with me culminated in talking about his pride of raising his family and now 2nd-generation American granddaughter. The first whole scene image is an attempt to tell the story in one image, but second uses a unique perspective and layers to recreate the almost surreal atmosphere of this little shop caught in time. Finally, I leave you with several examples of the use of layers to tell a deeper story with clear order and composition. Note in each of these images the clear delineation and relationships between elements and how the background elements provide additional context and story. At the next Thousand Oaks Photo Group meeting, I will be speaking on the use of gesture in photography to provide background and inspiration for their September Digital Composition Challenge. Jay Maisel on the Importance of “Gesture” in Photography from PDNOnline on Vimeo. Gesture is used to tell story and convey emotion. It can be the explicit and demonstrative motion of a high-jumper, or the subtle quality of a weathered rock. Our role as a photographer is to find just the right light, composition, and moment to capture gesture and to tell a deeper narrative. In this simple beach scene image, the landscape sets the stage for three little vignettes. Looking at the overall scene, one can observe the gesture of the landscape: the sky with its pleasant light clouds, the choppy, but fairly calm, waters of the Pacific, and the glare of the late afternoon sun. Examining the vignettes, presented mostly in silhouette making the gesture even more apparent, we see two children exploring the water, a lone swimmer, and a woman interacting with a child. In our minds we create a story. Are the children supporting each other, or is the boy taunting her, telling her she is a scaredy-cat for being afraid of such a small little wave? Is the lone swimmer escaping her company on the shore, or is she waiting for a companion to join her? Is the woman directing her child to something on the beach, or is she scolding her? We don’t know the true story from this picture alone, but the image provides the gestures, the clues, in order that we can stop and linger and imagine a story of our own. In my continuing beach project, last week I explored, through the use of gesture, the interactions of the great Pacific with the beach goers at Leo Carrillo Beach. A Street Photography Manifesto is available from my Blurb bookstore. I believe in the use of photography to tell candid stories that document the human condition in order to bring people together with understanding and acceptance. Create compelling stories: Say something, ask questions. Life happens in COLOR: Color carries emotional content. Create visual poems: Composition matters. Composition is additive: Use a lot of adjectives. Connect the dots: Capture the scene as the subject. Create short stories: Tell a story through time. Travel: Spread a worldview of understanding and acceptance. Take chances: An image is more than the sum of its pixels. Follow the National Press Photographer Association’s Code of Ethics. In this book I explain my manifesto, provide examples, and include a chapter on street photography technique. I am in a continuous struggle to balance my career, family, and photography. In the blissful time of my youth, the time before-career, my beloved Canon AE-1 went with me everywhere. I photographed everything. I photographed myself, my life, my friends. I carried my camera not due to some photographer’s principle to “carry a camera everywhere”, and certainly not because it was easy or always in my pocket like our smart-phone cameras today, but for the sheer fun of taking pictures. My photography was naive, but my images were authentic to my world as a young observer, seeing things for the first time, and delighting in capturing and exposing my world view to others. As I began to grow my (non-photographic) career, my attitudes and behaviors changed. With the external rewards for “adult thinking” and “emotional intelligence” over-shadowing the inner-reward of “childish play”, I became more serious. The role of photography changed in my life from playfully capturing everything around me, to documenting special occasions and sometimes going out “to-do” photography. Many years later, my career having reached an apex of sorts, I began a serious study of documentary-style photography. In additional to gaining a deeper understanding of what made a “good” photo, I wanted to learn more about the daily life of photographers. I wanted a window into their daily practice and their relationship with the camera and taking images. What I learned is that they never stop photographing. Not because it is their job, but because they can’t stop. They never stop “playing” with the visual representation of the world around them. For those of us with careers outside of photography – meaty, intellectual, challenging, satisfying careers – it is easy to loose focus on photography as play. It is easy to loose an attachment to photography in-between special trips or time allocated “to-do” photography. This summer I am working to return myself to the concept of “photography as play”. For you psychologists out there, the fact that I essentially just wrote that I am “working” to “play” is not lost on me. I am conflicted. As a compromise, I am “working” at a project to “playfully” explore something around me that I can chip away at in small increments. I wanted to find a subject that was unique to southern California that I could share with my husband. My choice was to take-on the beaches of Los Angeles and Ventura county. For days when I have more time, I might venture south to the always-entertaining Venice Beach or the egalitarian Santa Monica beach and pier. Because they have easy access, these beaches reveal a big crowded melting-pot of locals and tourists. Further north, and closer to my house, are the Malibu and Ventura County beaches such as El Matador, Leo Carrillo, and Point Mugu. Here, you find a more upscale local crowd. They are smaller, less crowded, and require a bit of local knowledge to navigate. This past month, I’ve managed several visits to these beaches, mostly accompanied by my husband and sometimes also his caregiver. It is challenging to work while in the company of others. Most non-photographers have little patience for the “slow-walk, stop, oh look over there” behavior of a street photographer, but that is the challenge. More than just saying “I was here”, photographs can preserve the memory of those lost, keep close those far away, document a collective, initiate improbably relationships, or simply allow a traveler to remember and share their experiences with others. This small selection of images (some of which I featured on my instagram and facebook feeds this past week), explores the consequences of image making. This coming week, I will feature some images of summer. As a street and social documentary photographer, I often wonder how the images will look through eyes of future generations, and what will change quickly and what will not. Creating a series of photography over a long period of time of the same place can help document those changes. It also challenges me to look for different views and different situations. I am now a little over 10 years into my journey as a serious student of photography. Many of my early images are of landscapes and flowers, but there are a few stand outs from some of my more frequented spots such as Santa Monica beach and the original Hot Dog on a Stick location near the pier and muscle beach – which also serves the best lemonade ever! My husband has somewhat of an obsession with their lemonade. When we head down to the pier, I know that a large lemonade is the price for a couple hours of his patience as I shoot. Over the years it hasn’t changed much. Each summer a new set of high-school and college students man the fryer and make large vats of fresh lemonade, and it still frequented by a wide variety of patrons – both locals and visitors. This weekend I spent time looking through all my photographs of this iconic location. It is a very small little universe occupying no more than a few hundred square feet. I don’t think I’ve yet done it justice. In looking back at my images there is not enough variety of situations, lighting, and scenes. I now have some new goals to start to examine not just the workers but also its patrons. Can I find my subject in people eating their hotdogs and enjoying their lemonade. How to I visually link them them to the Santa Monica beach vibe and the stand itself? And what does the back look like? This week I am dedicating my Instagram (Nancy_Lehrer) and Facebook (nancy.lehrer or Nancy Lehrer Photography) posts to photographs from the original Hot Dog on a Stick on Santa Monica Beach.